The SUP Travel Co, started its road to development in mid-2000’s when the concept was investigated to develop a truly amazing Stand-Up Paddleboard Travel Company. The problem was we were way ahead of our time and the market was so new that no one really even understood the direction Paddleboarding was going. We made a decision that when the time was right we would launch The Stand-Up Paddleboard Travel Company better known as The SUP Travel Co.
We are pleased to say that we will start our first trips in 2018 to a range of destinations and these will become available late in 2017 for booking. Stand Up Paddleboarding, also known as SUP or just Paddleboarding is the fastest growing water sport and leisure activity because a person can do it almost anywhere. It’s great for exercise on flat water, it is amazing to take to the sea/ocean and to enjoy the surf or paddle into coves and locations that are impossible to visit otherwise, or to enjoy on a lake. You can enjoy paddling down the river, running rapids, just cruising or maybe surfing the river – the bottom line is that SUP has something for everyone. 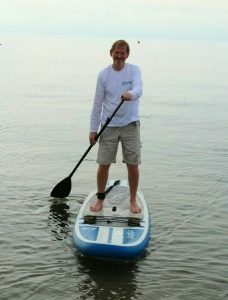 I have been involved with water activities and in particular surfing for over 40+ years. During that time I have grown up enjoying to the fullest that of longboard surfing, paddleboarding, kayaking, canoeing, and fishing. Surfing, however, runs through my bones, and today I live right on the beach overlooking an ever changing landscape and with it each different mood the ocean takes. I first tackled Paddleboarding in 1989 on a really large heavy longboard that was shaped for this experiment, and with a small paddle we caught waves into the beach at my local surf spot, it was fun and enjoyable. However, I will be honest and say my love was true with Longboard surfing until 2003 and Paddleboarding again came across my line of sight. Since that day I have not looked back and now enjoy a quiver of 9 boards for all occasion.